Cardinal Easy Read Thermometer makes quite an attractive displayed. 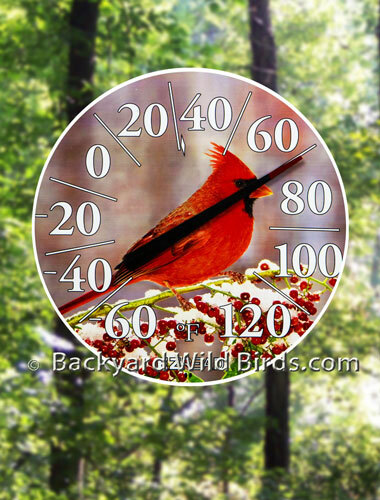 The Cardinal high definition Thermometer is a top quality Indoor/Outdoor Dial instrument that uses large easy to read numbers. This Cardinal is set in a wintery first snowfall scene is as functional as it is a work of art. 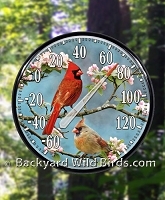 The 12.5" diameter Cardinal Wall Thermometer has UV color fade resistant ink used on plastic. Perfect for outdoor use. Great to be able to read at a distance! What a beautiful way to see the ouside temperature. 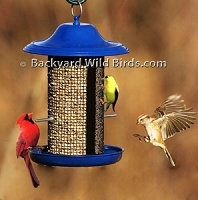 Makes an impressive gift for the birding enthusiast!